When it comes to business and residential phone directory listings, who ever even looks or even thinks of a print phone book anymore? They’re obsolete, as well as harmful to the environment both during manufacture and after they’ve been discarded to rot in a landfill by the thousands. No, with the omnipresence these days of smartphones, iPads, and just about any other electronic device you can think of, digital is clearly the way to go when it comes to getting the information you need, and there’s no better way to do it than with YellowPagesGoesGreen.org, a massive business directory website at the forefront of the environmentally-conscious “Green” movement. An innovator in digital business and telephone directory listings and an advocate for staunch environmentalism, YellowPagesGoesGreen.org is a cutting-edge website that delivers over 28.5 million up-to-the-minute Yellow and White page listings of businesses and residences throughout the United States. Whereas print directories are often out-of-date within weeks or even days of their publication and use up valuable natural resources in both their creation and disposal, YellowPagesGoesGreen.org is a fast, convenient, and easy way to access the information people need to find the goods and services that they want. YellowPagesGoesGreen.org’s listings are updated constantly every day, always ensuring their users will have the most accurate information and listings are any and all times; in an unstable national economy where businesses open and close ever day, consumers clearly need a more flexible and dynamic solution to their directory needs, and YellowPagesGoesGreen.org provides it in spades. In addition, YellowPagesGoesGreen.org users not only have the ability to search listings, but to add and maintain their own as well with downloadable Apps available for Apple digital devices – including iPhones and iPads – giving consumers the power of YellowPagesGoesGreen.org in the palm of their hand wherever they go. Okay, so you’ve been sold on going digital for your business and residential directory needs, but how do you stop the delivery of those pesky and wasteful print phone books that keep on landing on your stoop, year after year? Well, Yellow Pages Directory Inc. – owner of both YellowPagesGoesGreen.org and PaperlessPetition.org – offers an environmentally-friendly Web-based alternative to paper telephone directories while providing a simple and convenient mechanism for customers to opt out from the receipt of printed yellow books. Both web sites have been instrumental in promoting opt-out awareness across the United States over the past several years, and allowing users to reduce their own environmental footprints in the process. YellowPagesGoesGreen.org is THE place to go when you need information in a fast, easy, and effective manner that puts the sustainability of our planet first and foremost. They continue to push their vitally-important environmental agenda via their award-winning ‘green’ blog, and their strong support of the nation-wide opt-out movement allows citizens an easy and fast way to cancel home delivery of print telephone directories and help curb pollution and waste. 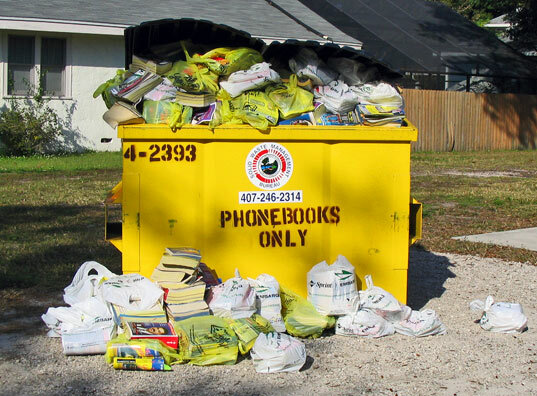 Remember, every little bit helps; a print phone book by itself may not seem like it would have much of an impact on the environment, but imagine the hundreds of thousands of them that are made – and thrown out – each and every year, and you’ll get the picture. Go digital with YellowPagesGoesGreen.org and save the environment and a headache!